Copland CDA 825 review | What Hi-Fi? Understatement may not sell a lot of products, but specialising in it has kept Danish manufacturer Copland in business for over 30 years. Over that time we’ve invariably admired the company’s products. They have tended to combine simple yet classy aesthetics with fine sound quality, all at sensible prices – sensible by high-end standards, that is. 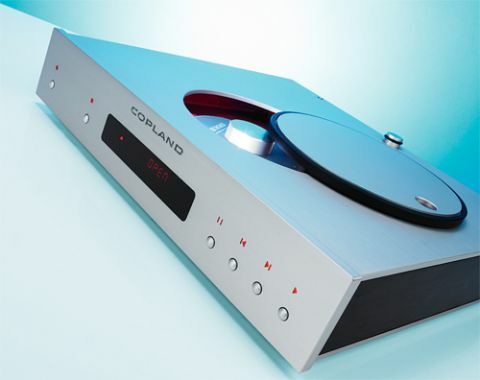 The Copland CDA 825 is a dedicated CD player, designed to get the best from traditional Red Book CDs. There isn’t even a passing nod to SACD, DVD-Audio or even computer audio. In fact, look round the back and you’ll only find a single coaxial digital output alongside the balanced and single-ended analogue connections. Copland has concentrated on getting the basics right. The casework is decently solid and beautifully finished, giving the player an aura of understated luxury. Unusually, the CDA 825 is a top-loading design. This somehow makes it seem more special than drawer-equipped units, but it does mean the player needs to be on the top shelf of any rack. The transport is a Philips CD-Pro2LF. It’s designed for top-loading operation and works with speed and quietness. The use of this buffer adds a two-second delay into the signal path, so if you press ‘Stop’ while a piece of music is playing then it plays on just a little longer before it actually stops. That feels a little odd at first, but we got used to it. Copland has followed the tried and trusted high-end route of using two DACs per channel. This lowers unwanted noise, so improving the signal-to-noise ratio. That should mean a better-resolved sound. The number-crunching devices used are well-regarded Wolfsan WM8741 24bit/192kHz chips. As always with good high-end kit there has been plenty of work put into the power supply design, analogue circuit layouts and choosing just the right components to acheive the best sound quality. Start listening and it’s obvious all of Copland’s work has paid off. This is a hugely capable player. One thing to take note of is that Copland’s signal output is on the high side. Through the single-ended analogue sockets it delivers 2.4 volts rather than the more usual 2.0 volts, and this doubles to 4.8 volts with a balanced connection, as opposed to the industry standard of 4.0 volts. While a highish output is not a problem in itself it does mean you have to be careful to match levels when comparing the CDA 825 to rivals. A louder sound invariably grabs a listener’s attention more during a comparative demo. The CDA 825 recovers an awful lot of information from CD. It has an open, spacious presentation that veers ever so slightly to the leaner side of neutral in tonality. We mention this more as an observation rather than a criticism. It’s just something to keep in mind when it comes to system matching. Feed the Copland a disc such as Nick Cave’s Push the Sky Away and the player shines. This album needs a subtle touch with dynamics and a high level of insight combined with a great sense of cohesion across the frequency range: the Copland gets it right. There’s lots of insight and enough clarity to render Cave’s low-key vocal performances with all the emotion intact. Move to something harder-hitting, such as Major Lazer’s Pon de Floor, and the Copland shifts up a gear with ease. There’s plenty of heft and the kind of solid, punchy bass that has a really physical quality. Unlike rivals such as the Naim CDX2 this Copland doesn’t push the rhythmic aspects of music to the fore, it’s a little understated in this respect. Take a close listen and you’ll find the information is still there, as is a fine sense of composure and organisation. Tchaikovsky’s 1812 Overture showcases the Copland’s dynamics and punch, but also gives it a chance to show off a wide and expansive soundstage, which is populated with focused and solid-placed instruments. The CDA 825’s broad spread of talents mean that it is right at home here, delivering a sound with ample drama and delicacy. In the headlong rush for music streaming it’s easy to forget that many of us still have large CD collections. If you really want to hear what’s on these discs the CDA 825 is a great way of doing it.